I'd venture to say that as carts go, this is the most sturdy, practical and reasonably priced cart on the market. It has saved my life (or at least my back countless times. 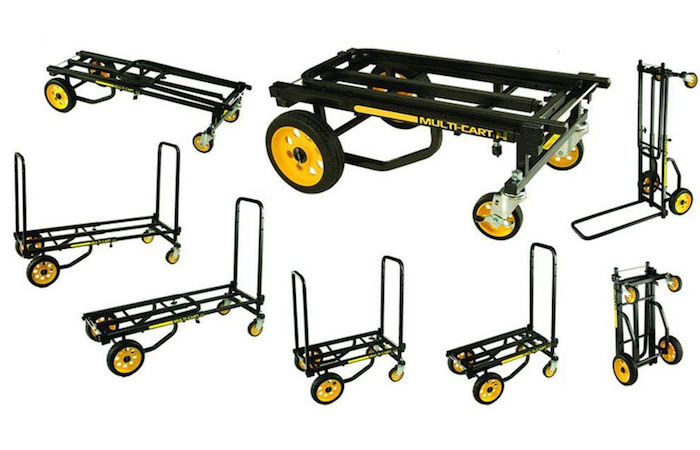 The Rock-N-Roller R6RT Multi-Cart holds up to 500 pounds, but best of all, folds up small enough to fit in the back of the trunk of my compact Nissan Sentra, leaving me with plenty of room for all my other equipment including. When I leave for a gig, I usually take along two cabinets each with 12" speakers w/horns; PA head, three bags containing all kinds of gear, mics and cords, and finally, a mic stand , a speaker stands and a music stand. So, it goes without saying - but I'm saying it anyway... the Rock-N-Roller Mini-Cart has saved me countless trips back and forth carrying heavy speakers long distances and saving a lot of time, too. The best part is, I can use it for multiple tasks. In fact, just recently, It came in handy in a most unexpected way. Being a musician means depending on gigs to make a living. However, not all of my gigs are musical in nature. I also do rideshare and other app-drive gigs in between the music gigs. This includes driving passengers for Uber and Lyft, dog sitting for Rover, and delivering groceries for Shipt and Instacart. Recently, while pet-sitting, I was just about to head home when I decided to check the Shipt app to see if I could make a delivery on the way. Sure enough, there was a request for a shop at the market right across the street from where the dogs I was sitting live. The customer was in my neighborhood, so it was an easy $9 for picking up a few items and dropping them off. As I neared the destination with the groceries, all the surrounding streets were blocked off. Turns out there was an apartment house fire and ny customer lived on the same block. So, I had to park a block away with bags of groceries including 2 gallons of mild and 2 gallons of fruit punch, an 18-pack of paper towels, a 12-pack of toilet paper and some food. Fortunately, I had my Rock-N-Roller tucked away in the back of my truck and was able to walk down with the goods in one trip. The customer left me a $15 dollar tip. This was recent, but the cart has paid for itself thousands of times over from all the gigs it's been used for. If you find yourself with more than you can carry on occasion, or in your business, I would strongly recommend getting the indispensable Rock-N-Roller R6RT 8-in-1 Folding Multi-Cart without a moment's hesitation.